“Luke Skywalker! I thought he was a myth.” So exclaims one giddy character in “Star Wars: The Force Awakens,” a movie brilliantly calculated to resurrect that myth and so many others for the satisfaction of the widest possible audience. Snazzily directed by J.J. Abrams with vibrant effects and a busy plot that sets the whole franchise in motion all over again, “The Force Awakens” delivers on expectations with a fun, polished space odyssey that embraces the appeal of the originals. The hype is strong with this one, but brace yourself: “The Force Awakens” does have flaws. It’s a little hokey in parts and at times distractingly self-referential, but that itself speaks to the nature of the material. Much as Abrams’ “Super 8” worshipped at the altar of Spielbergian sci-fi, “The Force Awakens” shows deep reverence for the first trilogy — even if it can’t duplicate its strengths. At this point, of course, anything remotely competent would heal the wounds of the much-maligned prequels; mediocrity was never on the table for this pricey endeavor. Acquired by Disney just four years ago, “Star Wars” needed to build on its roots while spicing them up for a fresh generation of audiences. Abrams gets the job done with a story mainly focused on new, young characters, while making ample room for the bulk of the original cast, and a decade-spanning story that bridges the gap between the two. While the Empire was vanquished long ago, the dark side has shifted to a new imperialistic regime known as the First Order. Among its senior operatives is Kylo Ren (Adam Driver), a wannabe Darth Vader replete with mechanized face mask. Equipped with a menacing multi-pronged lightsaber and Vader-like powers, Kylo leads the charge to find and kill Luke Skywalker — once a great Jedi leader intent on training more of his kind. But Luke, as the iconic opening scrawl tells us, has gone missing. His sister, who’s gone from Princess to General Leia Organa (a smirking Carrie Fisher, clearly pleased to be there) has sent the daring rebel pilot Poe Dameron (Oscar Isaac) to track down her vanished sibling, but it doesn’t take long for Poe to wind up in the clutches of the First Order. While these familiar names may suggest a comeback for the better-known faces of the “Star Wars” universe, “The Force Awakens” foregrounds its newcomers. Most of the screen time belongs to Rey (Daisy Ridley), a nimble raider from the desert planet Jakku, and Fin (John Boyega), a former Stormtrooper who defected from the First Order. It’s a welcome reflection of our progressive times that a modernized “Star Wars” assures central roles for a young woman and a black man, but these largely unfamiliar faces (Ridley has only a handful of credits to her name, and Boyega last dodged aliens in the jubilant invasion story “Attack the Block”) give the movie with its best scenes. Both aware of the “Star Wars” legacy and mystified by its lengthy history, their exploits provide a handy guide to navigating its latest challenges. Zany adventures ensue, with plenty of warp drives, laser-fueled battles and flying vehicles howling across many different skies. BB-8, the globular droid already immortalized at toy stores months before the new movie’s release, makes for an adorable update to the legacy of C-3PO. The Millennium Falcon hums back to life, this time with CGI monsters hiding in its hull. Han Solo (a wizened Harrison Ford, playing for laughs to mostly endearing effect) eventually resurfaces, back to his smuggler ways, with trusty co-pilot Chewbacca by his side. When the exposition speeds up, “The Force Awakens” becomes every fan’s idea of how the “Star Wars” world should look and feel. Abrams and cinematographer Dan Mindel recapture the bright colors of the universe, while John Williams’ boisterous score turns up the pervasive sense of awe. Industrial Light & Magic similarly delivers on expectations for effects. From lightsaber duels to twirling spaceship shootouts, “The Force Awakens” offers eyeball candy at every turn. Story-wise, the movie is somewhat clunkier. Co-written by Abrams, Lawrence Kasdan and Michael Arndt, it offers a handful of emotionally resonant moments, but mostly just salutes existing ingredients. Above all, “The Force Awakens” expertly resurrects the franchise’s simplest allure, if not the underlying thematic sophistication that made it engaging in the first place. Sometimes cheeky and obvious, but always sincere about the product it’s selling, “The Force Awakens” celebrates “Star Wars” by spicing up the surface details. There’s no doubting the Disneyfication at work here as the series gets relevant for its latest demographic. The younger characters speak in noticeably different vernacular than their forebears. (“You’re so right!” exclaims a villain early on.) Elsewhere, the youth express a kind of childish glee that reflects the mentality of younger viewers. After stealing a TIE fighter and pulling away from his assailants, Fin erupts with, “Did you see that!” Many scenes later, following a daring escape in the Millennium Falcon, he jumps up and down: “That was amazing!” He may as well be playing one of the many “Star Wars” video games from over the years. Of course, drawn into this spirited light show, it’s hard not to relate. Cynical viewers averse to this kind of super-sized product can fight it all they want, but “The Force Awakens” is certainly the most impressive achievement in Abrams’ career in terms of sheer scale. It excels at a form of slick commercial filmmaking designed to satisfy millions of viewers, which places it lightyears away from Lucas’ own idiosyncratic version of the material. Considering the resources surrounding it, “The Force Awakens” is a multi-billion dollar fan film of the highest order. Even callbacks to the original series that don’t quite land come across as good-natured attempts to demonstrate affection for the franchise. (“I’ve got a bad feeling about this” and “May the force be with you” both pop up rather earnestly). On one level, the “Star Wars” movies — blatantly inspired by silly “Flash Gordon” serials of the thirties — have always played with kitsch. Now they just do it with their own material. And that’s obviously what the people want. At the crowded New York media screening for the movie on Tuesday night, audiences burst into applause for the Lucasfilm logo in the first seconds. They burst into applause for the fanfare as the opening crawl began. They burst into applause when the opening crawl ended. They burst into applause for the arrival of every major character from the earlier movies. They burst into applause when the new characters took control. “Star Wars” movies will continue to hit theaters until at least the end of this decade. Chances are strong that the applause won’t stop anytime soon. 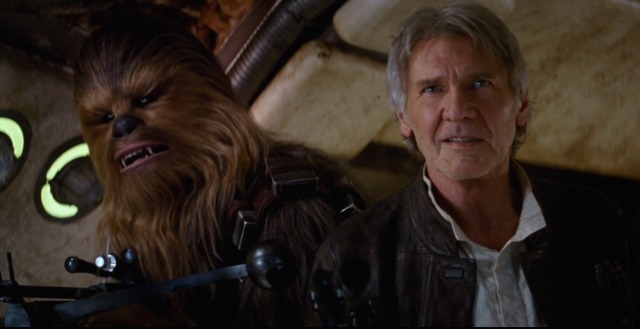 “Star Wars: The Force Awakens” opens nationwide on December 19.